CS 40 - Productivity with reliability! Intermec's CS40 is designed specifically for mobile field professionals who need productivity and reliability beyond a smart phone. The CS40 allows companies to improve their business processes, expand customer offerings, increase revenue and reduce the cost and complexity of a field mobility solution all at the point where it's needed most – on the front lines. 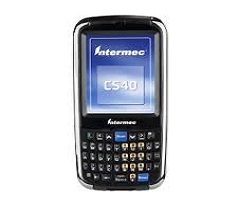 The CS40 is Intermec's smallest rugged mobile computer. It is designed to connect your mobile workforce to the enterprise for real-time access to business information and data exchange. It combines ruggedness, advanced 3.75G voice and data communications, as well as integrated high-performance 1D/2D scanning capability in smart phone size and style. Intermec is a world leader in the design of mobile computing devices that stand up to the rigors of everyday use, and the CS40 is no exception. It can withstand multiple 1.2-meter drops to concrete on all corners and all sides and is IP54 rated, which means it is sealed against rain, moisture and dust. The CS40 utilizes the proven Intermec EA11 imager that provides a familiar "laser-like" aimer and delivers high speed, accurate 1D and 2D barcode reading in any orientation. The no-compromise design also includes a high-performance 3 mega- pixel color camera with flash to easily capture photos, make notations, and transmit to the office for verification.